Do you remember my last post about Stone Farmers Market over two weeks ago? I bought a vegan black pudding! My regular readers will know that I'm not a fan of mock meats at all, but I couldn't resist buying this. 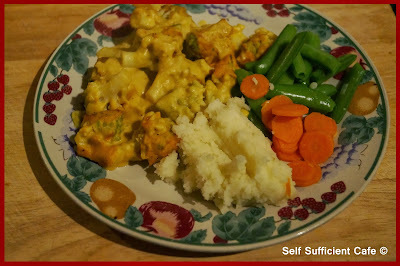 I wasn't sure if I would try it but I couldn't wait to serve it up to hubby to see if he noticed the difference! Ingredients: Cooked Pearl Barley, Rusk (Wheat Flour, Salt), Rolled Oats, Protein (Starch, Flour, Protein), Oatmeal, Non-hydrogenated Vegetable Suet, Salt, Barley Flour, Beetroot Powder, Herbs & Spices, Roast Barley Malt Extract, Natural Flavouring. Allergens: Wheat, Gluten, Celery. The verdict? Hubby didn't notice the difference until he saw it on my plate! Yes, even I tried it! 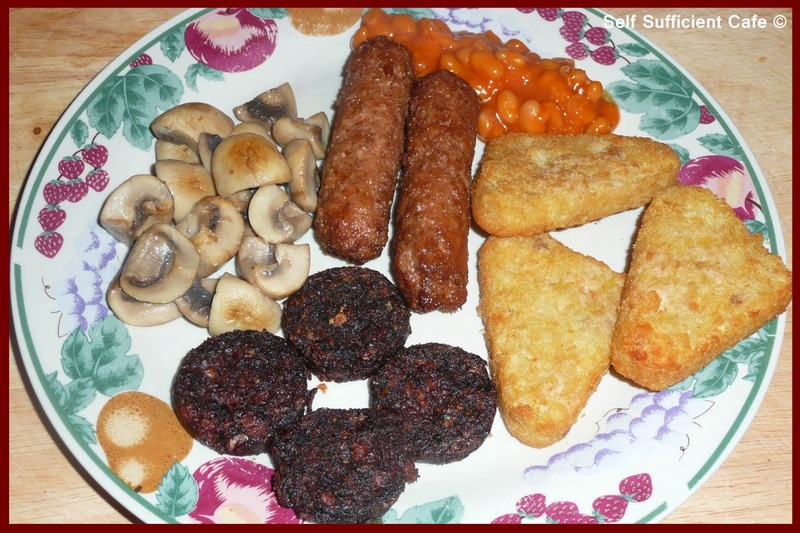 I was pleasantly surprised, I honestly can't remember what black pudding tastes like but this didn't remind me of meat so to speak. It was full of flavour and very 'herby'. Would I buy this again, yes I probably would but it's not something that we would eat a lot of, maybe just as a fry-up treat. Yesterday I blogged about the vegan swap box I sent to Nicky and today I'll be sharing what Helen sent to me. I think Helen must be physic, as the day my parcel arrived was the day the vegan biscuits ran dry from the biscuit tin at work! 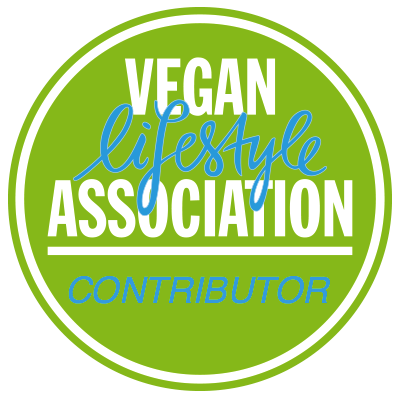 So I was chuffed to bits to see that Helen had included three Sasha and Mitsu's blog called tohappyvegans for further information and to subscribe. Its really good fun! 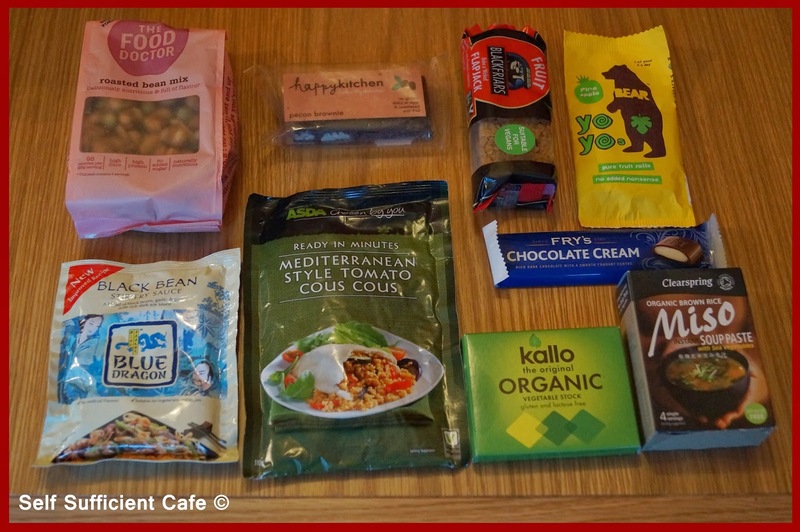 Every month you are assigned a partner to send a parcel of vegan goodies to and in return you receive your own parcel of vegan goodies. Another sweet item and a work day treat was the Yo Yo Bear Apple Fruit Rolls, I've not tried this flavour before and it didn't disappoint. 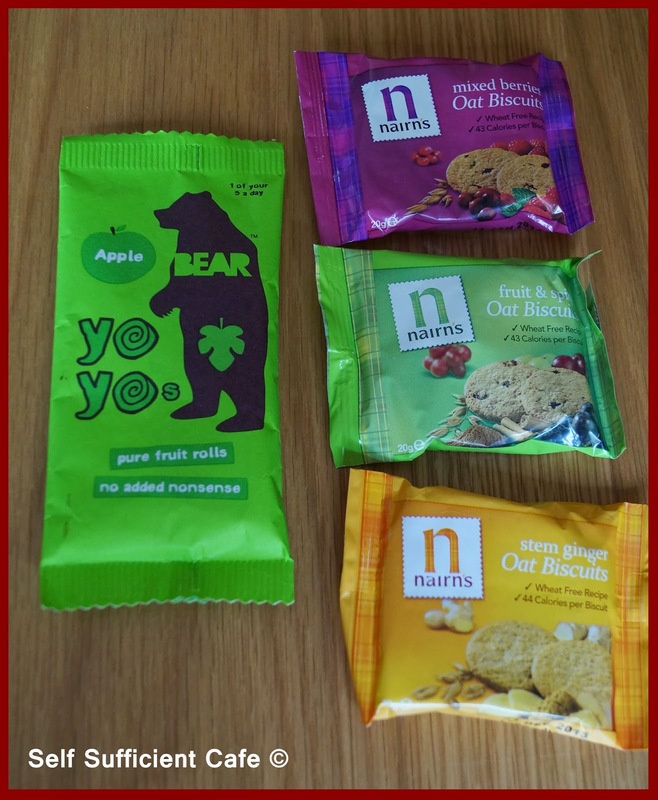 Yo Yo Bear do a variety of flavours including strawberry, apple, pineapple, mango, blueberry and raspberry. 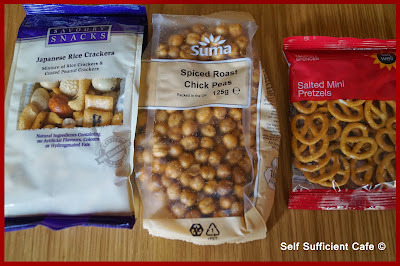 The savoury treats were also great, I've only recently been introduced to pretzels by a friend and at first I wasn't a huge fan but now I'm hooked and I don't think that's a good thing either! 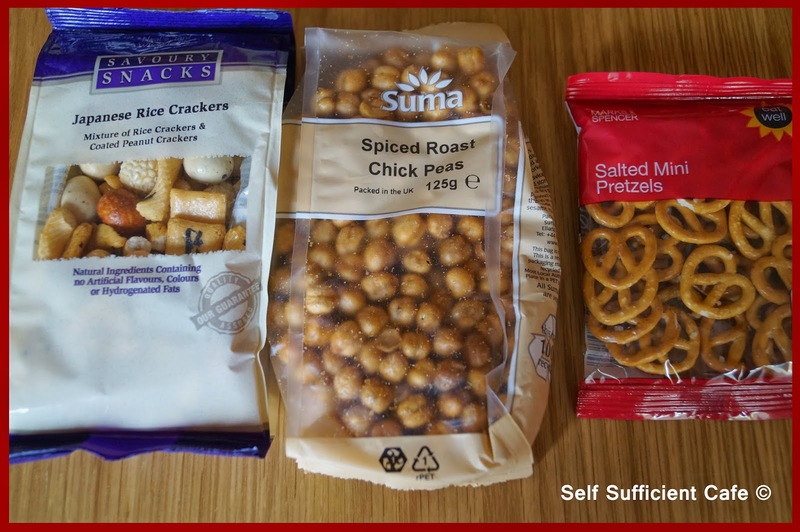 Helen also included some spiced and roasted chick peas which are great to keep that rumbling tummy at bay, a handful of these baby's just hit the spot, very tasty and kind of healthy :) Finally and by no means at least a packet of Japanese rice crackers. These were always a staple in my graze boxes which I don't do now as the vegan swap box system is much better! It's been a while since I last posted due to a rotten cold, working way too much and just feeling miserable due to my cold, work and the weather! But I'm pleased to say I've finally snapped out of it and this weekend has been a good weekend. My friend (my gardening angel) and I visited the Wolverhampton Vegan Festival, which was awesome. We had a brilliant day even though we ended up like pack donkeys walking to the bus stop after spending probably too much money. But that post is for another day. 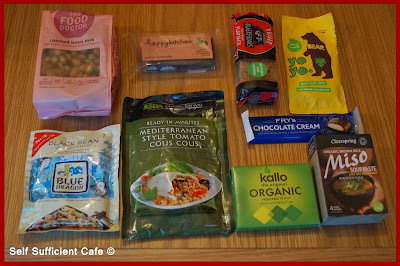 This months vegan swap box was once again a delight to be part of and my parcel of vegan goodies was sent to Nicky, who doesn't actually live that far from me. Today is Nicky's birthday so many happy returns Nicky, I hope you're having a fabulous day! Hopefully, I got the mix just right, with a little sweet to go with the savoury. The Fry's chocolate bar is a must, as I've said before I only found out these chocolate bars were vegan through an earlier swap box and I was amazed that they were, so I'm spreading the word, so to speak. Unless, of course I was the only vegan in the world who didn't know they were vegan! To add to the sweet selection I included a blackfriars flapjack (try saying that 10 times fast), which I first saw in my local co-op and bought a load! Since then people have told me they're widely available but I've yet to see them elsewhere. 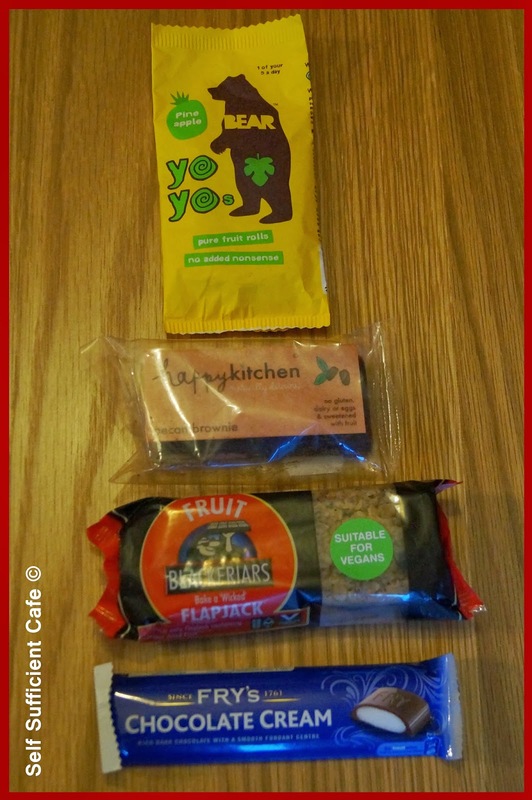 To balance things out I also added a packet of pineapple fruit rolls from Yo Yo Bear and a pecan brownie from Happy Kitchen, another find through the vegan swap box, their website advertises that they use organic ingredients, bonus. 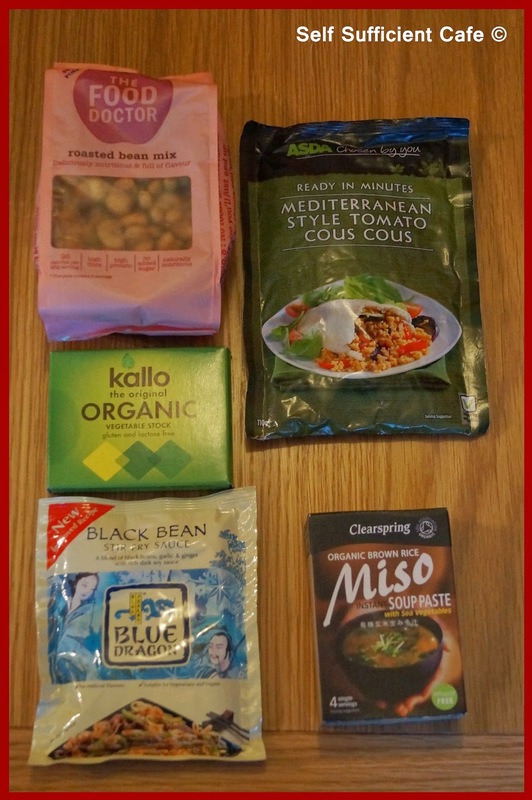 The savoury items included a packet of roasted beans, which are delicious and a more healthier snack than a packet of crisps. I need to take heed of my own advice here! The Food Doctor range is quite expensive, but in my opinion worth it. I also included two further organic foods, the vegetable stock cubes and the very handy store cupboard ingredient a box of Miso Soup Paste. Kallo stock cubes come in a range of flavours, including french onion, mushroom, garlic & herb, tomato & herb as well as a couple of non vegan flavours. They also make Belgian Dark Chocolate Rice Cake Thins which are scrumptious. The other two savoury items are quick go to ingredients to make things easy when you are cooking at night after a long hard day at work; ASDA Mediterranean Tomato Couscous and Blue Dragon Black Bean Stirfry Sauce. The Black Bean sauce is good to have on hand so you can whip up a tofu and green pepper stir fry in no time at all. I also included three different flavoured tea bags and of course I couldn't let Nicky's birthday pass without a little gift; a dragonfly bag charm, which I bought from a local gift shop. In fact it was where I did my aromatherapy blend course. I quite often pop in to say hi to Maggie and see what little treasures are on offer. I hope Nicky liked her swap box, tomorrow is a post about what I received from Helen. I was absolutely gutted that I missed out on the London Veg Fest, I won a ticket too but unfortunately I couldn't make it due to other commitments :( I did however manage a trip to Stone Farmers market which was held over the Stone Food Festival last weekend (Friday to Sunday). The Stone farmers market is the best in the area and every time I go I'm sure it grows by a couple of stalls. The farmers market is normally held on the first Saturday of every month so the next one is Saturday 2nd November. However during the Stone Food Festival the market is on both Saturday and Sunday. If you live nearby you really must take a trip and see what's going on. 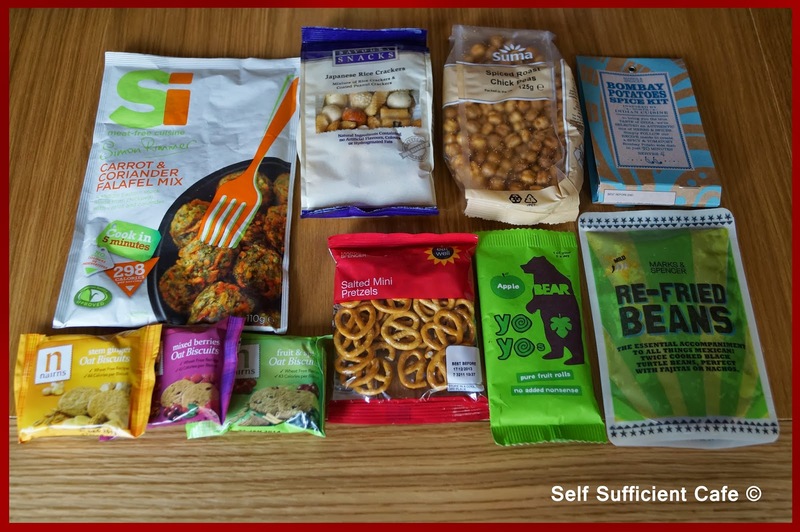 I was pleasantly surprised to find some vegan food for sale too so I couldn't resist buying it, in fact I spent a fortune! There were your usual vegetable stalls selling lots of organic lovely produce and my favourite stall is the Derbyshire mushroom stall which sells a variety of mushrooms from Crimini, Shiitake, Oyster, Enoki and Porcini. I always buy a large mixed punnet as I love my mushrooms! I also bought a jar of porcini powder, which you can use to enhance the flavour of casseroles, stews, soups or any dish really. It adds depth of flavour to a dish and is a fantastic ingredient to have in your store cupboard to perk up a dish that needs that something extra. As well as the usual stalls that sell a variety of olives, sundried tomatoes, garlic, dolmades and artichoke selections, there were bakery and cake stalls, Indian food, the usual non vegan stalls and a couple of stalls selling their wares from local breweries and vinyards. A great selection for the vegan and non vegan alike. 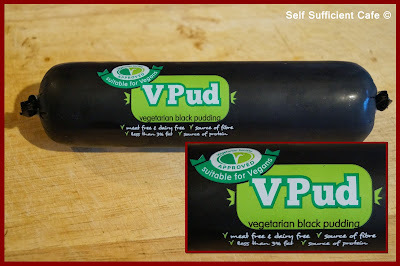 My regular readers will know that I'm not a fan of mock meats at all, but I couldn't resist buying a vegan black pudding. I'm not sure that I will try it but I can't wait to serve it up to hubby to see if he notices the difference! Another purchase which I was over the moon with was from the "snoggable garlic" stall, Belinda makes three vegetable/nut roasts, two of which are vegan! Yay! One roast will feed two people although they are sold as single portions. She also sells a variety of olives and dolmades which are stored in olive oil rather than brine so they taste much nicer! With all this lovely food about we got hungry very quickly and munching on some garlic stuffed olives wasn't enough to curb the hunger pains. I've not had a great deal of success in Stone with finding vegan food but then again I haven't particularly looked that hard and I'm sure if I were to give any restaurant ample notice something would be prepared for me. But just on the off chance we nipped into Fleur's Tea Rooms and I was pleasantly surprised to hear that their vegetable chilli was in fact vegan! All in all a pleasant day out! 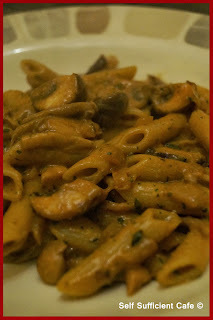 So what did I do with all those lovely mushrooms I turned them into a pasta dish. Add the pasta to boiling water and cook for 10-12 minutes or until al dente. Meanwhile fry the onion in a little olive oil until starting to go brown, add the garlic and continue to cook for another 2 minutes. Add the mixed mushrooms and 1 table spoon of the mushroom ketchup, cook until the mushrooms release their liquid and then add the other tablespoon of mushroom ketchup along with the paprika, garlic granules, lemon thyme, porcini powder and flour. Stir to combine and cook for another minute. Slowly add the soy cream a little at a time until all the cream has been poured in, cook slowly to heat the cream through and thicken the sauce. Add the vitalite and quickly beat into the sauce with a wooden spoon to give a glossy shine to the dish. 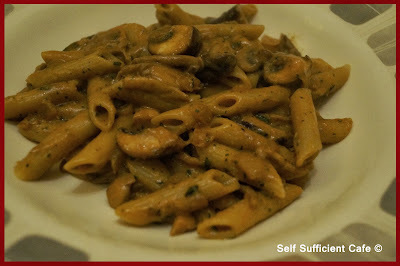 Drain the pasta, reserving a little of the water and add to the sauce. 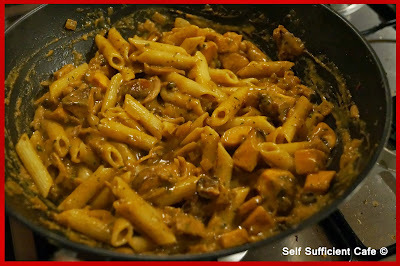 Stir to combine and add a little of the reserved water to thin the sauce down if needed. Serve at once. Apologies for the bad photo's it was a late night tea and my two bulbs in my kitchen light had blown! Well, it's been a whole week since I last posted, I can't believe how time flies and I can't believe that I managed to post everyday during September. Some bloggers say it was easy and have carried on posting every day but I was glad of the rest. But I'm back and with another 'cheese' sauce recipe but this time for cauliflower cheese. I had fun creating 'cheese' sauces for the Mac 'n' Cheese Mondays throughout Vegan Mofo that I will carry on experimenting with vegetable 'cheese' sauces for a while. 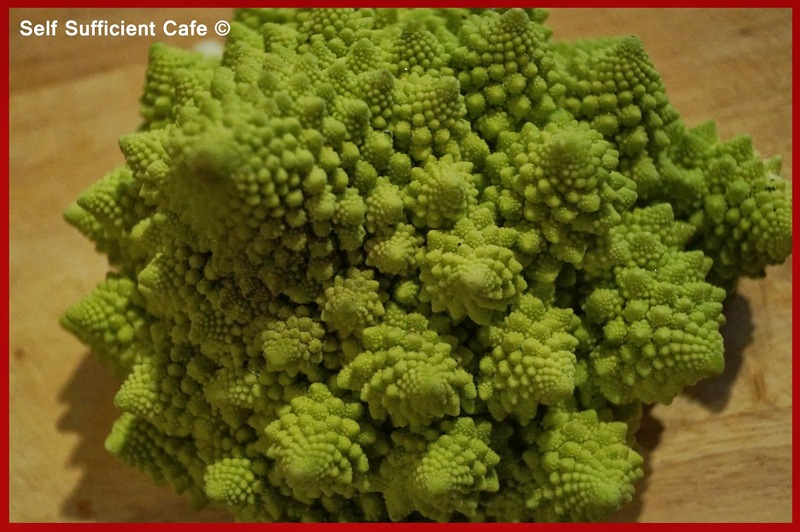 I had bought a beautiful romanesco cauliflower from the local green grocers in town a few days ago now and it had been sitting in my fridge waiting for me to create a dish worthy of its beauty. These cauliflowers are so pretty it's actually quite hard to face cutting it up! Boil or steam the cauliflower until al dente and transfer to an oven proof dish. Fry the onion in a little olive oil until translucent about 5 minutes. Add the drained sweetcorn and stir to combine, fry for another couple of minutes and transfer to a liquidizer. 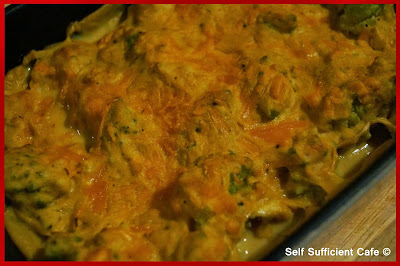 Add the mustard, milk, nutritional yeast, salt and pepper and blend until smooth. My liquidizer isn't powerful enough to make a completely smooth sauce it leaves the outer skins of the sweetcorn kernels, so I pushed the liquid through a fine mesh sieve into a saucepan. Heat gently to a simmer, turn off the heat and add half the grated cheese and stir until melted. 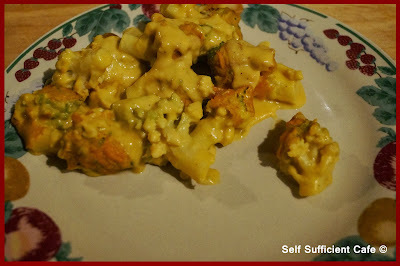 Pour the sauce over the cauliflower florets and top with the remaining grated cheese. Bake in a moderate oven for 20 minutes. And not a bean in sight! But not too worry there will be more beans eaten this year as I harvested another 2kg of runner beans from my 6 plants yesterday!